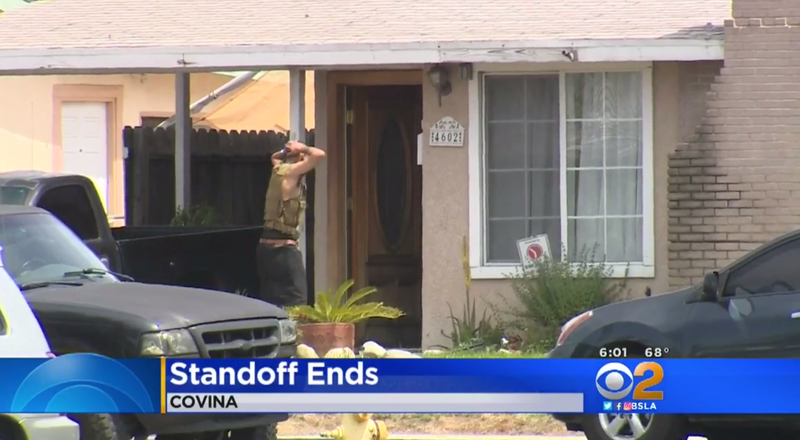 COVINA, Calif. -- Authorities say Sean Vazquez, a man suspected of firing at deputies, has been taken into custody in Covina, California following an hours-long barricade and surrender broadcast over Facebook Live. The incident unfolded before 10 a.m. Sunday when deputies received a call of an assault with a deadly weapon, CBS Los Angeles reports. “We heard three gun shots a pause and then three to four more after that,” witness Gena Valtierra told the station. When authorities responded to the scene, Vazquez allegedly began firing rounds at deputies. Shots continued and were even aimed at the police helicopter in the sky. Octavio Medina, Vazquez’s stepfather, said the man was high on drugs and in the house with a friend. A few hours into the standoff a man came out, was questioned and released. Meanwhile Vazquez was talking to the sheriff’s department throughout the standoff, airing it all on Facebook Live. “Tell your men to stand back I’ll (expletive) walk out surrendering,” Vasquez said through the Facebook video streaming service. He was taken into custody just after 1 p.m. without incident. Nobody was hurt. The sheriff’s department says Vazquez had a juvenile record. Medina told CBS Los Angeles that life has been difficult for Vazquez ever since his younger brother drowned a few years ago, which was followed by the death of his father. “He’s a good kid, he’s a good kid. He just has some pain in his heart that he’s fighting demons,” Medina said. It wasn’t immediately clear whether Vasquez was facing charges.